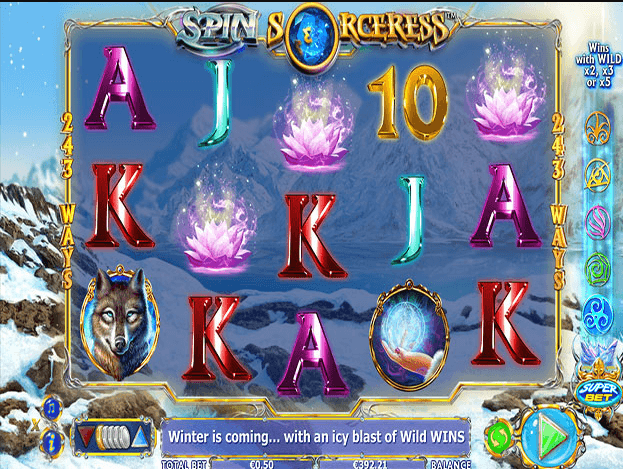 Dive deep into the mysterious end with this 5 reel slot with 243 paylines and an intriguing mystical theme. You get to adventure with the beautiful sorceress Pörtelina in the dangerous mountains of Nåltakallt. This game has something called a “SuperBet function” that you might be familiar with, I will explain it briefly. The idea is that the more coins you bet the higher the multiplier gets for all your wild wins. The default mode is to play with 25 coins and a multiplier of 1, at 50 coins you reach SuperBet level 1 and your wild wins will get a multiplier of 2x, 3x or 5x. There are five different levels of SuperBet, level 2 is achieved by betting 125 coins and the multipliers will be 5x, 8x or 12x. Level three is reached at 200 coins and brings the multipliers to 10x, 15x or 20x. Level 4 is achieved at 300 coins with an increase to 15x, 20x, or 25x. The final level is reached at 500 coins and the multipliers take a huge leap on this level, all the way up to 20x, 30x or a whooping 50x multiplier on your wild wins.